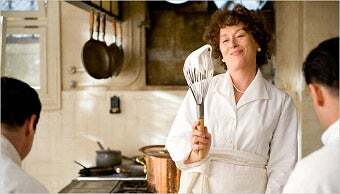 Julie and Julia, dealing as it does with food, required a lot of artistry. Not, as one might expect, of the mashed-potato-sundae, corn-syrup-painted-raw-turkey varietal, either: this was real food, top quality, that the actors had to eat. Says writer-director Nora Ephron, who tasted everything, in the New York Times, "I wanted that sole to look to the audience the way it had looked to Julia when it caused her famous epiphany," about cooking for life. The stylist, Susan Spungen (Martha Stewart's former food editor, so no stranger to perfection) and a host of other stylists, share some trade secrets, from catering to the vegetarian character actor who went meat-eating Method on set, to the trials of crafting mock meat for those veggies more committed to their lifestyle. Of course there are practical concerns, too: apparently J&J called for mock lobster-boiling, created through illusion and the auspices of a vigilant animal-cruelty monitor. There are plenty of great food movies: Big Night; Babette's Feast; Eat, Drink, Man, Woman; Like Water for Chocolate and Willy Wonka usually rank pretty high for hungry cinephiles, while even those who deplored Marie Antoinette as an extended music video can appreciate the glory of the skyscrapers of Laduree macarons. There are some - Chocolat, No Reservations - that fail, in my opinion, to make anything remotely appetizing. A Night at the Opera Specifically, the steerage dinner scene. This involves mountains of spaghetti which, as a little kid, basically seemed like nirvana to me. Nuff said. Fried Green Tomatoes Everything looks really good at the Whistle Stop, especially the FGT. Hell, they can even make barbecued abusive redneck tasty. A Christmas in Connecticut. You know the part where Barbara Stanwyck goes to Felix's restaurant downstairs and he has some kind of 1940s Hungarian buffet? That always appealed to me. There's a very similar resto in The Babe Ruth Story but the ambiance is somewhat lacking. Naughty Marietta. A dark horse, yes. But the scene where they go to the little restaurant and have fresh bread and shrimp with garlic? Delish. Cold Comfort Farm. Both the tea room's offerings and the country fare at the end of the wedding are scrumptious-looking; I have a weakness for cream cakes. Cyrano de Bergerac (1990) The scene where Roxane's maid gets that huge bag of fresh pastries to distract her was extremely distracting to those of us who had to watch it in French class the period before lunch.